My edition: Paperback, published in 2011 by Egmont Books Ltd, 280 pages. Description: Each night when 16 year-old London Lane goes to sleep, her whole world disappears. In the morning, all that's left is a note telling her about a day she can't remember. The whole scenario doesn't exactly make high school or dating that hot guy whose name she can't seem to recall any easier. But when London starts experiencing disturbing visions she can't make sense of, she realizes it's time to learn a little more about the past she keeps forgetting-before it destroys her future. Part psychological drama, part romance, and part mystery, this thought-provoking novel will inspire readers to consider the what-if's in their own lives and recognize the power they have to control their destinies. 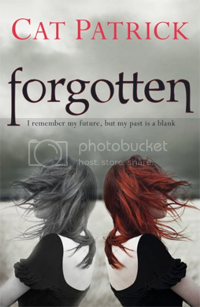 Forgotten centers around a very fascinating and unique concept of someone who's brain resets each morning at 4.33am, meaning that she "remembers" the future and not the past, not even what happened yesterday. This kept me wondering throughout as to how main character London could possibly remember anything at all: the fact that she has this strange disorder, her mother, the layout of her room and tests she studied for, to name a few examples. She couldn't possibly fit everything in her notes nor did she have time to reread each detail every morning before school. One could argue she "remembers" these from the future, but then as the school year comes to a finish she couldn't "remember" various things anymore such as her locker number as the Summer was ahead of her, which makes one wonder if the memories ahead are incomplete and jumbled too. Another question that came to mind was how 4.33am fit into this (despite the rather poor explanation in the book I doubt that her brain works on an exact 24 hour schedule without taking in to consideration daylight savings for instance). It gets especially confusing and frustrating when you sit down and properly dissect the theory around this disorder as it's easy to find many more flaws and examples as to why it is impossible for London to live even a remotely normal live and not be locked up in an institution while her brain undergoes continuous tests. Yet, despite the many confusions I was endlessly fascinated by the concept (and also, admittedly, by main love interest Luke). The book felt very short, more like an introductory chapter to what is yet to come, so for now I am assuming that my concerns will get addressed properly in the follow-up book(s).